Last week the 2017 Ottawa budget season began in earnest with the start of a six-week community consultation process. Much of the consultations will likely be focused on the need for city services. Community organizations are looking for increased funding for social service agencies, and a low-income bus pass in this year’s budget. But, equally important is the other side of the ledger — revenues to pay for those services. During the 2014 election campaign, Mayor Jim Watson pledged to keep property tax increase at 2 per cent. He has held to that promise despite facing a $41 million shortfall heading into the 2015 budget and a $37 million shortfall heading into the 2016 budget. While the mayor and city councillors managed to balance those budgets, and are expecting to end this year with a small surplus, fulfilling this pledge came with a cost. That cost is the squeeze on services for Ottawa residents. Just to maintain existing city services, revenues have to keep up with increases in the number of Ottawa residents who access them and in the cost of services. When property taxes rise less than inflation and population growth, the city’s most reliable source of revenue lags behind actual needs. A new study by Carleton University’s Centre for Urban Research and Education shows the impact of that squeeze on Ottawa’s services. It shows that social spending has lagged behind inflation and population growth. It also showed that spending on policing and protective services rose at a faster rate, as did spending on culture and recreation. The study demonstrated that, between 2012 and 2016, on a per capita basis, net spending on community and social services declined from $222 per person $200 per person, while police spending increased from $264 per person to $288 per person. It also showed that, in relative terms, the proportion of net spending on community and social services fell from 15.8 per cent in 2012 to 13 per cent in 2016. How do Ottawa’s property taxes compare? In 2015, average residential property taxes in Ottawa were $3,811, marginally above the provincial average. In contrast, Ottawa’s property tax rates are below the provincial average. A better measure of affordability is the share of household income that is accounted for by property taxes. The chart below shows that share for a number of comparable Ontario cities as well as the provincial average. 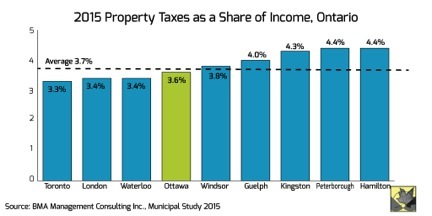 At 3.6 per cent, Ottawa property taxes as a share of income is below the provincial average. There is still time for the mayor and council to reverse course and increase property tax rates sufficiently to maintain services that residents rely on. After years of austerity, it’s the sensible thing to do moving forward. Sheila Block is a senior economist with the Canadian Centre for Policy Alternatives’ Ontario office. Follow Sheila on Twitter: @Sheila_M_Block.